When it comes to wake sports, the more the merrier. Not only is it fun to have your crew on board to push you towards a new trick, but also those people add to the ballast of the boat, boosting your wave. So when Monterey expanded their Surf Edition lineup last year to include a 23-foot model, the 238SS, that means you can add more people to your session! I like this move by the Florida boat builder, because it seems like the general consensus with all of the stern-drive powered builders who decided to release a surf boat, was that 23-feet was going to be their starting point. Monterey went smaller, introducing first the 218SS which we reviewed as well. 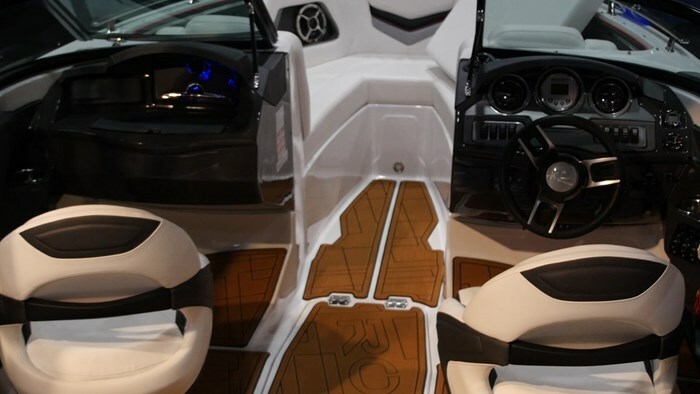 By introducing this new model, Monterey shows their dedication to this new market of surf boats, powered by Volvo Penta’s forward facing outdrive. Before we talk about the boat I think it’s important to quickly overview this drive as then all of the “surf features” of the 238SS will start to make sense. 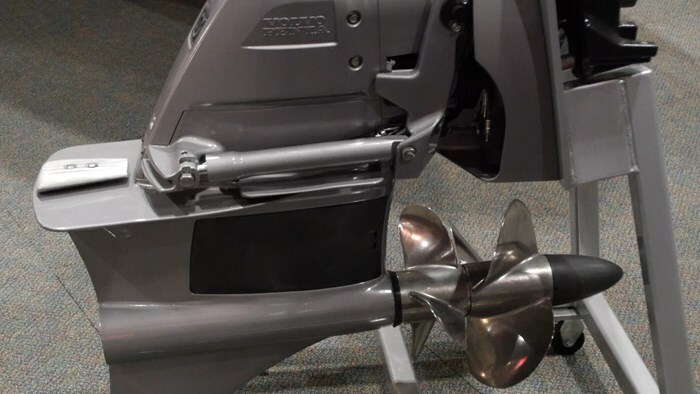 In a simple explanation, the Volvo forward drive is a “pull drive.” Instead of the propeller being mounted at the back of the outdrive, like traditional applications, it is mounted at the front of the drive. This means it pulls the water rather than pushing it, but even more so is that it is more efficient overall because the propellers are always touching “clean” water. 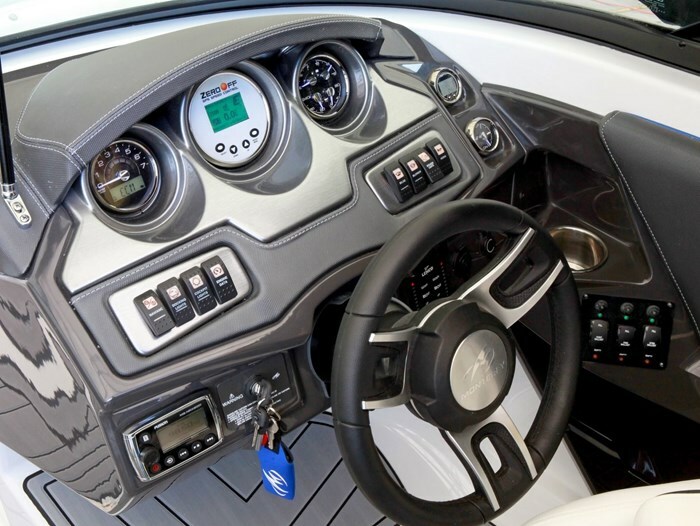 For watersports, and more specifically surfing, this makes is safe to do so behind an IO sterndrive because the propeller is not only tucked up under the boat, but the drive blocks the rider from the propellers. This is perhaps the most important element of the surf package, because all of the other elements are useless without a safe means to surf, which the forward drive provides. 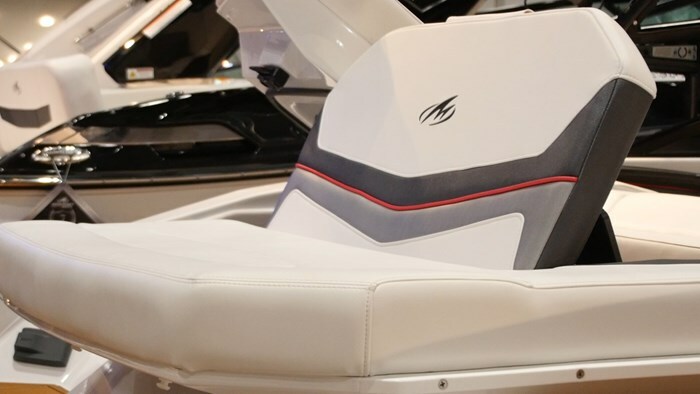 The other major surf features of the 238SS Surf Edition are the integrated ballast system, the zero off speed control and the WakeWorx surf tabs. 2200 pounds of ballast are used to make your wave big. Essentially the more water you displace means the bigger wave you will produce, it’s the reason why cruisers throw up such a big wake. So you create that effect with integrated ballast of which the 238SS has two bags at the stern of the boat (one on each side) and one in the center to make up that 2200 pounds. Making sure you’re able to get the best wave possible, Monterey uses WakeWorx surf tabs that allow you to customize which side of the boat you want to surf. These tabs look like trim tabs but you put one down depending on what side of the boat you want to surf and it will ensure you will have the cleanest wave possible. Finally, if you can believe it, speed is very crucial to surfing. The difference of half a mile an hour can make a considerable difference in the characteristic of the wave. In the boat you may not notice it but the rider certainly will so the 238SS has a GPS based Zero Off speed control system. The controls for all of these can be found up at the helm of the 238SS. The helm is cleanly laid out, with all the controls within reach, should the rider want to make a change on the fly. It’s nice to make changes without having to take your eyes off of the water in front, and the placement of these controls allow you to do this. 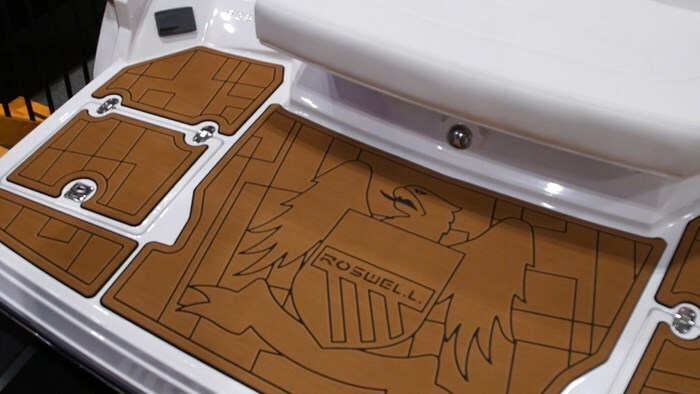 The secondary features and those of which that are part of the Roswell Package include the collapsable wake tower along with board racks and speakers to keep the tunes cranking. The styling on the 238 SS is eye catching and sharp. I think it has the right amount of flash, without being gaudy or running the risk of being out of date in a couple of years. It starts with the choice of either a white or black hull, then one of 4 different metal flake accents, and the Roswell crest and eagle mid ship. Monterey is known for their styling and design, so they made sure to stay true to those roots when venturing into this new segment. The European influenced sunpad at the stern is spacious and features a hidden lounge that folds up out of the bed. This rear facing seat will be great for when it’s time to chill, but it is recommended to stay inside of the cockpit when the riding starts. 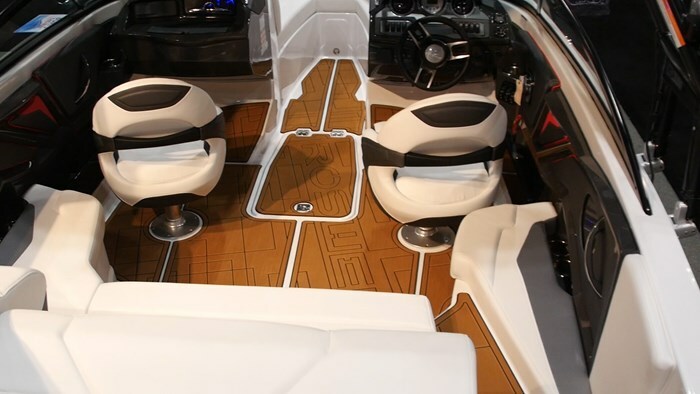 This won’t be such a bad thing when you sit down onto the tastefully designed rear bench seat that wraps around the port side of the boat, transitioning to a three position companion lounge that can face forward or aft, depending on where the action is happening. 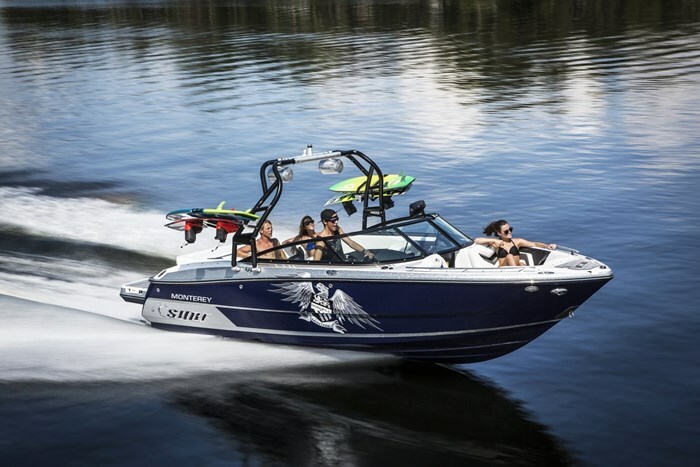 The bow on the 238SS is top shelf, with stylish accents, moulded deck liner, plenty of cupholders and speakers. Storage is abundant in this boat with plenty under all of the seats, along with a massive locker on the port side of the engine. 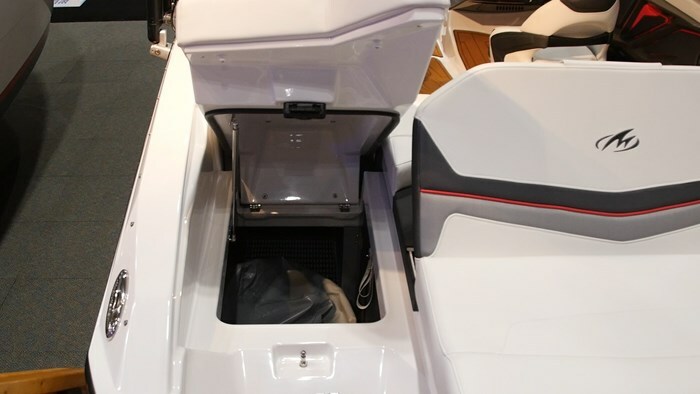 This is accessed from the swim platform as the lid hinges up to give you storage large enough for boards. I’m impressed with what Monterey has done with this surf line. 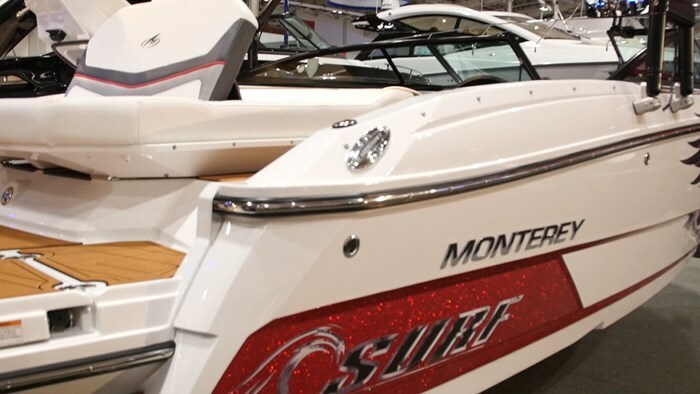 They were able to stay true to their roots, while still offering a boat that is different enough to grab the attention of the water sports fan. This is going to attract the high end buyer that wants to get out and enjoy the surf lifestyle, while doing it in exactly that - style.